This violin created by Carl Becker in 1949 is part of the Steans Instrument Bank. In its continuing mission to nurture the next generation of performing artists, the Ravinia Festival maintains an instrument bank through which it lends high-quality instruments to selected young professionals accepted into Ravinia's Steans Music Institute. The first instrument acquired by the collection is a 1949 Carl Becker violin, which was presented to Ravinia in the fall of 1998 by the late Joseph Bernstein of Glencoe, the founding donor of the Instrument Bank. 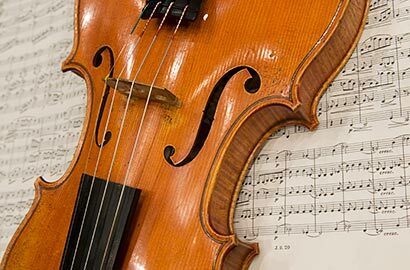 Other violins are a 1778 Joseph and Antonio Gagliano instrument; one handcrafted by Joannes Tononi of Bologna, dating from circa 1690; and one made by Eugenio Degani of Venice, dating back to 1891. 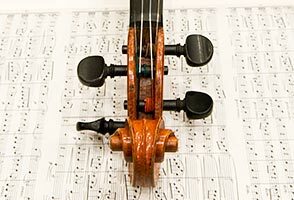 The Institute also owns two violas, one a Spanish instrument dated 1767 by José Massaguer and the other a modern American instrument, the work of Douglas Cox of Vermont. Three cellos complete the collection: one made in London by John Betts and dating from the period 1780 to 1785; another, also from London, the work of Richard Tobin dating from around 1820; and the third a Vuillaume dating from around 1860. The need for an instrument bank was recognized at the end of Ravinia’s 1996 season when world-renowned violinist and Ravinia's Steans Music Institute Program Director Miriam Fried reported that some of the young string players who won admission to the Institute could not afford quality instruments on which to develop their talents. Earlier that season, Mr. and Mrs. Richard Cohn had expressed an interest in providing a better violin for the recipient of their scholarship. Supporters of the Steans Music Institute immediately began discussions on how to formalize an instrument-lending program, and the Cohns were among the first to contribute to it. Gifts for the instrument bank have come from The Barbara, Patricia, and Richard Cohn Family Foundation; Mrs. Irl H. Marshall, Jr., a Ravinia Life Trustee and member of the Ravinia Festival Women’s Board; Brooke Kolar, a member of the Ravinia Festival Women’s Board; The Ruwitch Family, in memory of Robert S. and Shirley Ruwitch; The Stepan Company, through John Stepan, a Ravinia Festival trustee and Ravinia's Steans Music Institute Committee member; a gift from the Dr. Scholl Foundation; an anonymous foundation gift; and a matching grant from The Helen F. Whitaker Fund. The instrument bank is now complete unless additional contributions of funds or instruments are received.